Big Brain steps forward, bringing his unique brand of psychic villainy as one of the minis in the Supers Unlimited launch later this year! 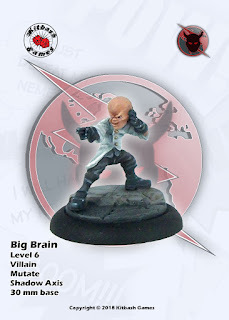 We will launch the Supers Unlimited line with at least 9 miniatures (4 heroes, 4 villains, an Anti-Hero and maybe more! ), and Big Brain will be part of that. You can read his story here (click for link) to find out more about this megalomaniac mentalist. Well painted, he looks fabulous. Do you have an idea when the release will be?